What's your disability/handicap? - page 1 - the polling booth - Furtopia | Family Friendly Furry Forum and IRC Chat! Do you have a disability/handicap? The definition of a disability/handicap can vary greatly among the medical community. What disabilities/handicaps do you have, if any? What have you done to cope with having a disability and trying to live a normal life, or as close to normal as possible? Do you think there needs to be more recognition for people with disabilities/handicaps, and more laws, assistance, etc. created by governments to help people with disabilities? Autistic, depressed, anxiety, and a nerve disorder. I am convinced I have dyspraxia, although I have yet to be officially diagnosed with it. I can check off all of the symptoms in the gross motor control area, hand dominance, speech, perception and memory. When it comes to eyesight disabilities, I've got everyone beat. I've got 20/900 in my left eye which is considered legally blind, and currently about 20/200 in my right eye. I have detached retinas in both eyes. They are so bad that no medical procedure in the world can correct what I've got. Eyesight. I'm nearsighted in one eye and farsighted in both. I use trifocals, but can't wear them under a fursuit head and make do with contacts. One for distance correction (right eye) and one for reading correction (left eye). 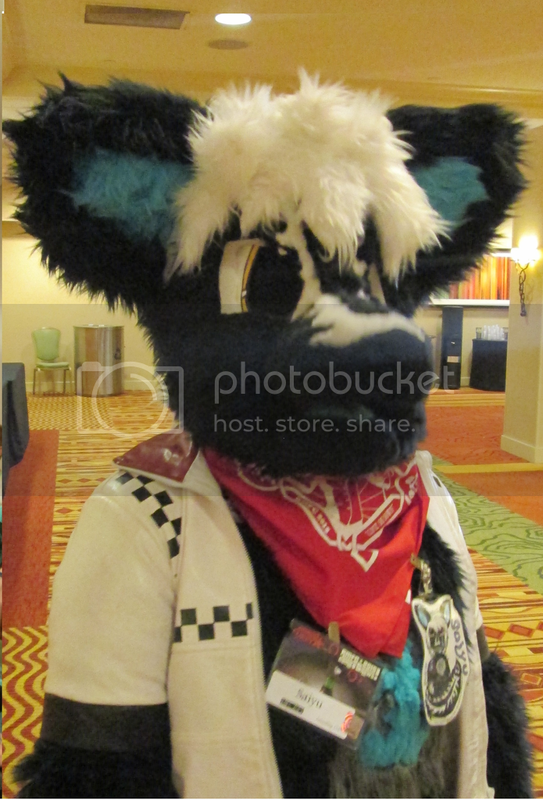 Everything is still fuzzy, and wearing a fursuit head makes it even harder to see. But I adapt--I just move more carefully. I'm nearsighted in one eye and farsighted in both. Huh? How can you be nearsighted AND farsighted in one of your eyes at the same time? pin hole camera, with glasses to make a minor correction. vision. Except perhaps to keep from running into something large. optomistrists at the time. The oil bubble acted like a backside lens. so my pet can show me where the bad guys are. background though.. That's how I see to be on the forum. I make the best of it, and I am usually too busy to worry about it. I cannot legally drive without my glasses and I can't see the finer details in things that are further than five feet front face. I can't read the text I'm typing on my iPod touch's screen when holding it at arm's length without my glasses on. Let's just say, some would call me "special". I am legally blind in my left eye. I have like a stretched nerve or something behind the eyeball and my brain never really tried to make a connection to it. I wear glasses all the time, my right eye needs them so I can see a lil more clear outta it. The left side of the lense is more or so just for show... for "balance". I very much consider them to be a disability, as they stop me from going about normal day to day life, holding down work, and making secure, long lasting friendships. So we all have different handicaps and disabilities in one form or another. Let me throw another question at everybody: What are/have you done to overcome your disability? Sometimes, people's disabilities get people so down that they just "give up". But then, there are others who don't let their disabilities stop them from doing the things they love or want to do in life. As my mother always used to say: "You can do anything you want to if you just put your mind to it." My eyesight is so bad as I already mentioned before. But I still build model kits as it's a hobby I enjoy. The parts may be small and the "quality" of my finished work may not match that of a professional model builder, but I do the best that I can. Sometimes, I've even been known to beat other people's better models at contests. My eyesight is poor, but nowhere near as bad as Kobuk's, but I still build my robots, program my games, write my stories and I still try to draw pictures. Sure glasses are a burden, but without them, I wouldn't be able to do what I love. So that's that. I;m deaf in the right ear, blind in the left eye, and dead from the waste down. The eye adn ear I still have aren't as good as before tje cancer. To overcome my dyspraxia, I've worked at meditation and mild exercise over the years. Some days are worse than others, but I get through it. Mindfulness helps me focus when I am feeling off balance (listening to classical music especially enhances this). Exercise helps me practice my sense of balance and direction. I'm able to perform some yoga poses, which also helps improve my sense of balance and control. I'm proud of the fact that I was part of an expedition to excavate dinosaurs a few years ago. I also successfully completed my field courses while I was in grad school, which was a huge challenge too, considering how turned around I get direction wise and how my decreased gross motor skills don't help much while I am climbing over rocks and up hills. Despite my limitations....I did it...I did what I wanted to do since I was a kid. I am also proud of the fact that I can figure out which transit lines work the best for me so I can continue my career in science education, despite my inability to drive. I also somehow managed to keep my driver's license, despite my current accident prone driving record. I had the McIndoe procedure in my early 20s and I have managed to maintain my relationship with my mate for the past six years. days. Mostly fix ready to heat and eat foods, but some simple cookiing too. determination and unwillingness to give up. kids that might pass along my bad genes..
That's not a disability. That's just being lazy. Go ride a bike, go to the library, visit friends, play some basketball, go to the park. Go do SOMETHING that gets you out of the house. I have autism too and yes, you can say that. Each person's experience is different, I figure. I personally am fine with my autism, but then again, I'm fine with a lot of things.